The following sermon was preached in the seminary’s Chapel of Martin Luther by Dr John Stephenson on the Festival of St Simon and St Jude, Tuesday, 28 October 2014. Leaving aside the question whether Oberman’s observation applies to the lecturing style of your German- and British-born professors, we would have to agree that maybe, on balance, and perhaps are qualifying expressions that don’t belong in the pulpit; they have a place in learned journals, but they clog the arteries of proclamation and catechesis. Since keeping saints’ days on Sundays is a judgement call made in the province of Christian freedom and 28 October rarely falls on a Sunday, most pastors are hardly ever called upon to speak about St Simon and St Jude from the pulpit. Here at the seminary, where we have weekday services, it’s a different matter, with the result that this is at least the third occasion on which the homily for the day of Simon and Jude has fallen into my lap. But we are vouchsafed only a single detail about the Simon in the apostolic band not surnamed Peter, and oh dear its meaning is not crystal-clear. When Matthew calls him a Kanaanean with the variant Kanaanite, he likely does not mean to imply that Simon was a native of Cana in Galilee, nor is it probable that he was a pagan from the geographical area we know as Canaan: Matthew begins the noun that we render as the Canaanite woman with chi, the aspirated k. No, Kanaaenean with a kappa or hard c likely transliterates a Hebrew original and means the same as Luke’s information that he was “called the Zealot.” Even here, one website I surfed to insisted that Simon’s zeal had nothing to do with some political affiliation on his part, but described his ardour for Christ and the faith. Well, the balance of evidence indicates that, before our Lord called him, Simon was one of the liberation theologians of the day; there’s a good case for labelling him a terrorist or a freedom fighter, depending on your point of view. In this case, the king and the kingdom he first sought, and the king and the kingdom that came his way, were not at all one and the same thing. But, bless my soul, you really can’t base articles of faith on conjectures such as these. Again, why do Matthew and Mark place the Judas not Iscariot (and therefore known as Jude to keep him distinct from the traitor) in tenth place in the apostolic order of precedence, while Luke lists him as apostle number eleven? Why does Matthew give him the name Thaddeus, and how come the textual variant Libbaeus crept in? Does Matthew’s putting Thaddeus immediately after James the Less, the son of of Alphaeus, while Luke pinpoints him as “Jude of James” mean that he is the brother of James the Less, and that there were thus three, not just two sets of brothers among the Twelve? Moreover, is it even remotely possible that today’s Jude is identical with the author of the letter that Dr Luther teaches us to call an antilegomenon, bracketing it off from the major writings of the New Testament, while not daring to exclude it from the canon? I certainly don’t have a definitive answer to any of the questions, which only underlines the point that you can’t base articles of faith on maybe, on balance, or perhaps. 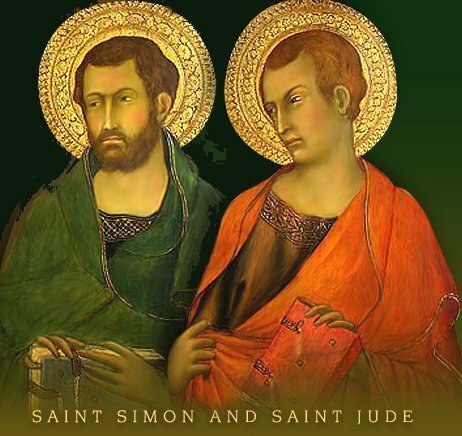 It appears that we remember Simon and Jude together on account of the thinly substantiated report that they embraced martyrdom at the same place in Persia at the same time after giving their all in missionary apostolates devoted to carrying out the mandates of the Risen Lord. Well, the Church remembers that John was the only member of the Twelve to die in his bed, and so LSB plays it safe by having us hear of an upsurge of violence against Jeremiah that led almost but not quite to his death, and by having us listen to our Lord’s prophecy that as the world hated Him so it would also hate His emissaries. But if the details of Simon and Jude are wrapped in a cloud of uncertainties, there are no ifs, buts, or maybes about the One whom they proclaimed and brought to people in the far corners of the ancient world. As they exercised the office with which Jesus invested them, Simon and Jude remain living stones in the foundation of the Church, and they discharge a corrective function as and when you and I align themselves with them in order to keep our proper place in the grand human edifice that the Lord is still building across time and space; and we do this by focussing on the Jesus whom they proclaimed to the world. And Jesus preaches blessed certainty in response to the question posed to Him in the upper room by the second Simon, a question that is actually a cloaked complaint: “Lord, how come You are going to manifest Yourself to us and not to the world?” In other words, “Why won’t You be the kind of Messiah that the unreconstructed Zealot within me thirsts for You to be, the sort of Messiah who rules in the manner of Tiberius and holds sway over a kingdom that we can see with our eyes and measure with regular verifiable, tangible instruments?” Simon had a whole season of ministry to wrap his mind around our Lord’s response, an answer that speaks to us as we prepare once more to approach the altar: “If a man loves Me, he will keep My word, and My Father will love him and We shall come to Him and make Our abode with him.” Here we have something sure and solid that transcends the scholarly tones of one nation or another; here everything hinges on a word spoken without coercion, with a two-way flow of love, and with the wonder of wonders that the Blessed Trinity takes up residence in the depths of your being. Let this word of Jesus illumine the communion you have today with Him, with Simon and Jude, and with all the saints.